The Gorilla DS-1 has been designed for DJs, by DJs so every detail has been cleverly thought out. This stylish and robust DJ stand won't look out of place in any surrounding whether it's in your lounge, bedroom or studio. Fully adjustable and universal, twin arm CDJ stand. Designed so that your mixer can be placed upon the steel base plate. Base: 415 x 477 mm. The two trays can independently tilt down at variable angles and are set in place with a secure bolt locking system. 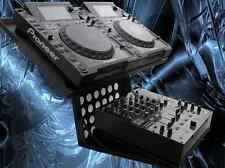 dj matrix stand cdj2000 djm pioneer etc..
Mixer ramp. This stand has been designed to combat this. Along with a few noticeable features such as Great item arrived very fast! dj matrix ex stand cdj2000 djm pioneer etc..
Mixer ramp. This stand has been designed to combat this. Along with a few noticeable features such as Top shelf approx 43" long. Great item arrived very fast! This DJ stand will accommodate 2x 1210s, 2x CDJ's @ 320mm,a standard size mixer like the DJM800 (Max 360 Wide) & Speaker Stands. DS2000 - DJ Turn Table Stand with Speaker Stands. Above speaker stands are included (Decks, CDJ's etc are for display only). 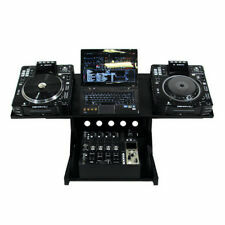 Sefour X5 DJ Stand Black Studio DJ CDJ Turntable Deck Black X 5. Fully adjustable in depth and angle. Total loading weight of 25kg. Top plate: 1150 x 440 mm. Weight 15.6 kg. Bottom plate: 440 x 440 mm. 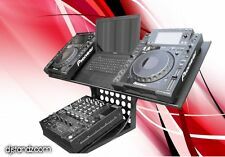 Product Range: PULSE DJ Stands. Adjustable platform width and angle. Adjustable stand height. During that process you will be issued with an RMA number. 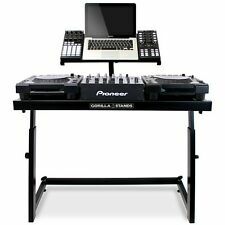 Sefour XB030-901 CDJ Laptop Effects Pad CD Player Stand for X10 / X25. Novopro CDJ Dual Table Stand. Heavy duty professional CDJ stand. Designed to Hold Any CDJ sized players. 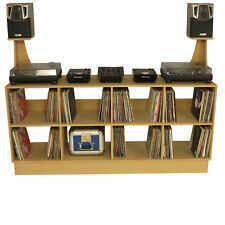 Fully adjustable universal twin CD stand. Why people choose Bop DJ. BOP DJ Showrooms. Adjustable tray height and left/right angle adjustable. This DJ stand will accommodate 2x 1210s, 2x CDJ's @ 320mm,a standard size mixer like the DJM800 (Max 430 Wide) & Speaker Stands. DS2000 - DJ Turn Table Stand. Want a smaller desk?. Check out our DS1000. Rubber strip edging around the top panel prevents any marking of your CDJ's, laptop, etc. A fully adjustable combination stand creates the ideal DJ workstation for holding your CDJs, Mixer and laptop. DJ Booth DB3 2 x CDJ stands ASMP. Ideal for Technics, CDJ's, and Mixer. Item supplied ready assembled on a pallet. We can custom build to suit you. Real wood veneer £500. Clear £450. Stained mahogany, oak etc & clear lacquer £650. Ideal for CDJ's, and Mixer. With 2x CDJ's at 320mm wide there is room left for a 320mm wide mixer. DJ Booth DB2. AB, BT, CA, DD, HS, IM, IV01-55, JE, KA27-28, KW, LA15-23, PH01-26, PH30-44, PH49-50, PO30-41, TR21-25, ZE. DJ Booth DB3. Ideal for Technics/CDJ's, and Mixer. Item supplied ready assembled on a pallet. Beautifully finished, Strong & stable, Built by professionals with pride! We can custom build to suit you. This stand is large enough to fit a pair of turntables or digital decks along with a mixer and laptop, allowing you to fine tune your mix session before taking it to the big venue. 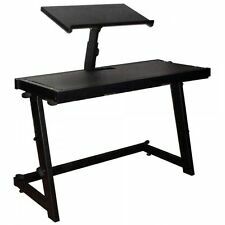 Solid table top giving you stability for your decks and mixer. Holds most tabletop mixers (up to DJM 800 size inc. DJM 700, DJM 600, DJM 500, DNX 1500, DNX 1700, DNX 1600, DJX 750, DJX 700 etc). Stylishly designed to keep all units in optimum positioning, the wing stand allows you to dj unhindered, regardless of set-up and combination. Adjustable tray height and left/right angle adjustable. Trays tilt down at different angles and set with locking pin. The trays are depth and width adjustable to fit most players in the market. During that process you will be issued with an RMA number. Price includes cut-out's for 2x turntables or CDJs and 1x mixer. Width = your mixer width 1190 (With 1210's or similar size deck) minimum 1450mm. Sunken Deck SD Deck stand DS1 Veneered. With 2 x CDJ & 1 x Laptop stands. CDJ and Mixer Metal Stand. Condition is Used. Will fit anyingthing upto a cdj 1000/2000 CD player on the shelf and a standard 4ch mixer such as a DJM 800 underneath I have put a led strip on underneath which is powered via a USB adapter of slot on a laptop. 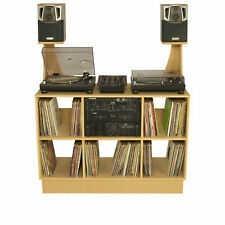 Product Range: PULSE DJ Stands. This stand is large enough to fit a pair of turntables or digital decks along with a mixer and laptop, allowing you to fine tune your mix session before taking it to the big venue. 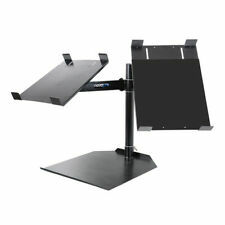 Professionalextension for laptop or mixer for JJ-T stand with regulated height and angle. An optional case secures the stand and makes transport easy. desk – 300x600mm. weight – 16,00kg. weight – 4,40kg. Heavy duty professional CDJ stand. Adjustable tray height for each arm and left/right angle adjustable. Tilt adjustable angle for your players - set in place with secure locking bolts. The solid, powder coated steel plate gives a secure and stable base for the stand and for your mixer to be placed upon. DSCD - DJ CDJ Stand. The DSCD is designed for 2 Cdj's & Mixer with space below for CD's and amp, 2x CDJ's @320mm Mixer @ 390mm. Ideal for CDJs, Mixers, Keyboard, Effects units etc. Beautifully finished, Strong & stable, Built by professionals with pride!